This is my favourite deck (thus spent the most money on out of my decks), and my most used one, due to my preference for Big Mana/control. It's not your top meta, but it did help me through quite a lot of duels, and is the main deck of one of the OCs in my fanfic. However it might be somewhat slow compared to the current meta, so hopefully after the HoF things would slow down a little for Big Manas and slow controls to thrive again. Lion King Baki might be more popular, but old white Baki is by far my favourite type of this deck. Faerie Life*4: Basic early boost, with ST.
Pixie Life*4: Basic early boost, Zero recovery for Baki and VAN Beethoven. Faerie Shower*4: 1:2 advantage card. Ideal 3rd turn move, and pushes you to 6 mana next turn at no loss of hand number. Comes with ST and is multicoloured for a bonus. Intense Vacuuming Twist*4: 4 cost bounce, cheapest fixed removal in the deck. Also used to keep up the tempo of the deck and search for cards while taking care of system creatures like Magnum or Entertainer. Super Eternal Spark*2: Cost 5 removal and also white mana. Gets rid of small system creatures, draghearts and also D2 fields, while increasing the number of shields for Gachinko Judge. Eternal Trap*2: White/green mana and stopper. Due to the abundance of monocolored/semi-mono decks it is of great use to stall the opponent until you get the parts to win. However the recent rulings render it unable to stop sealed creatures and pre-ryukai Draghearts. Crystal Memory*1: 4 cost search for anything, and invisible to opponent. In reality adds *1 to every other card in the deck, and can search for Ninjas in a pinch. Seventh Tower*1: HoF boost. Metamorph allows a 3 boost to 10 mana, and 11 on the next turn, smoothing the way into Baki/VAN Beethoven. Kaiser Baki*2: Deck concept. Colourless Hunter Dragon, cost tramples a Hunter from your hand, mana and grave for each Gachinko Judge won. Mostly a 2-3 win would be the result, but that is quite enough for most situations. Since there is no restriction on the Hunter trampled, even evolution creatures can be trample, depending on the build. VAN Beethoven*1: Dragon and Command Lock, and a colorless Dragon. Although a very powerful lock, he's not to be overestimated since there are a variety of ways to get around him. That said, mass bounce and lock does make him a viable voice in a Big Mana deck. Top of Romanesk*2: White/red/green mana, 2 boost, blocker and a dragon. Remake of Romanesk, but cheaper and no mana burn at the end phase. A cheap dragon to trigger Diehard's ability and also Blocker to stop weenies. A smooth transition to larger creatures. Meteorite Ryuusei*2: White/red mana, Speed Attacker to all of your creatures and a Hunter Dragon. Used to plow through blockers and also produce punching bags for Diehard's ability. Diehard Ryuusei*2: Red Hunter Dragon. Burns a shield every time one of your dragons attack and loss aversion effect to stall for time. Perfect synergy with Meteorite Ryuusei and Baki, the former for sandbags+SA, the latter for revival from grave and mass Hunter spam. Onimaru Head*1: HoF Hunter Dragon. Gachinko Judge grants extra turn, and may save you in a pinch by getting rid of tapped system creatures while winning an extra turn. Although not the first and foremost choice for winning, he does grant a great tempo advantage once he wins a Pachinko Judge. Bolbalzak Ex*1: Red/green Hunter Dragon. Untaps all of your mana, and basically a free extra dragon. Combined with mass amounts of mana you would be able to do a variety of moves depending on the situation. 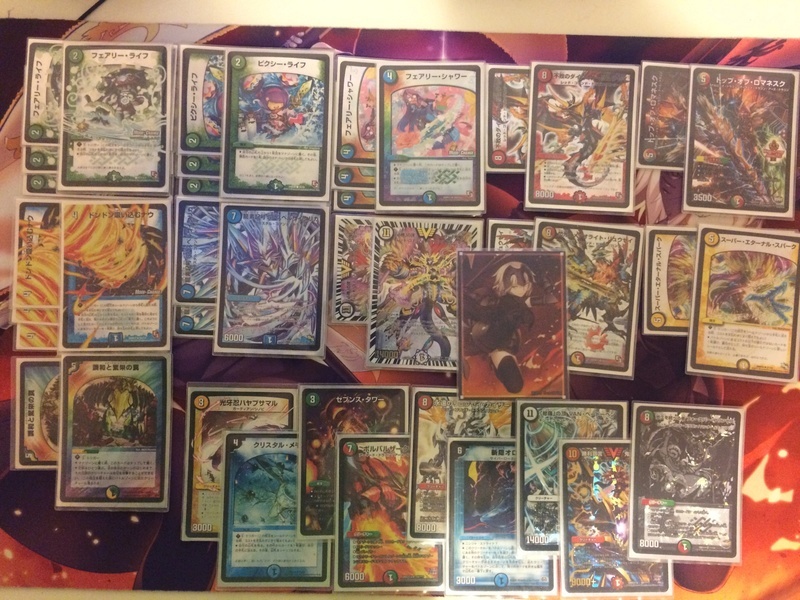 Forever Princess*1: SA Red/Green Hunter Dragon. Cost trample meta, milling meta and deck recovery. Due to the appearance of 0 Triggers and the unbanning of Sorge Jin I find her a viable choice in the deck to stop those, more or less, and the cost trample meta does help a lot at times. Eternal Ryuusei*1: Red Hunter Dragon with Madness, creature tap-in and SA to all of your creatures. A stall for SA centered opponents, and also a finisher to trample with Baki. I particularly like this version of Ryuusei in my deck. Spellcyclica*3: Blue Dragon. Spell recovery, tempo maker, shield burn with Diehard, and deck recovery. Although his value has diminished with time, sheer versatility has made him a very powerful creature even now. Hayabusamaru*1: Hof Cheap Ninja for blocker, a lifesaver in many decks and situations. Can turn other creatures into blockers too to get rid of opponent's larger creatures. Orochi*1: 2nd Hof Ninja. Gets rid of opponent's creatures, once chance Diehard when you need him, and also extra attackers when your opponent has blockers on the field. Suggestions are always welcome, and thanks for reading. Actually like other big mana decks you need to watch out for hard rush. By hard rush i don't mean redzone and stuff but stuff like Gatling rush and Darkness Nature Rush (Zabi Claw, Death March, Huckle Kirin Swayer etc.). I had Baki decks being killed by those before (Although it was a ruins of the lion king baki) and the guy was using outdated cards. Not even Truce can save you most of the time because when they rush you don't have enough mana to loop them yet. Plus sometimes depending on your ST luck not even HG stops those. @Mr-ex777 wrote: Actually like other big mana decks you need to watch out for hard rush. By hard rush i don't mean redzone and stuff but stuff like Gatling rush and Darkness Nature Rush (Zabi Claw, Death March, Huckle Kirin Swayer etc.). I had Baki decks being killed by those before (Although it was a ruins of the lion king baki) and not even Truce can save you most of the time because when they rush you don't have enough mana to loop them yet.